Mesa Verde National Park (1906) - also a UNESCO World Heritage Site (1978), located in the very southwestern corner of Colorado. This park was created to protect and preserved mesa and cliff dwellings of the Ancestral Pueblo people who made it their home from A.D. 550 to A.D. 1300. 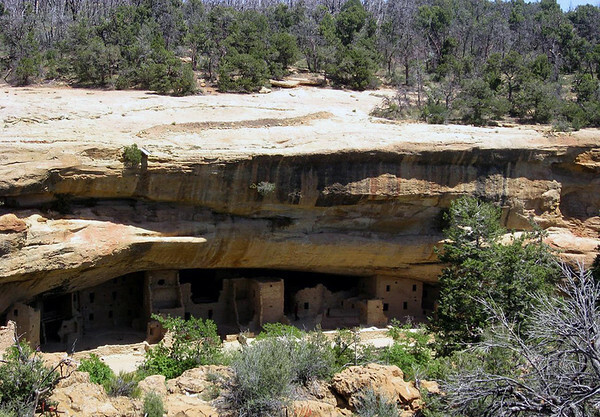 Today, the park protects over 4,000 known archeological sites, including 600 cliff dwellings. Geologic formations in the park consist largely of sandstones and shales. Four major plant communities are located here - at the lowest elevation is the shrub-steppe community that includes sagebrush valleys, then as you gain elevation, you move through pinyon-juniper forests, to mountain shrub communities, and finally to areas of Douglas-fir and Ponderosa pine. Spruce Tree House - in the alcove shadow, below the Chapin Mesa - Mesa Verde National Park, established in 1906 to "preserve the works of man", the first national park of its kind.